In the face of a tough market for juniors, the world's largest mining show, the Prospectors and Developers Association of Canada’s (PDAC) Convention, still managed to stay above 30,000 for the second year in a row. The PDAC executive said that 30,147 attended the four-day mining showing, which started on Sunday and was held at the Toronto Convention Centre. Attendees were investors, analysts, mining executives, geologists, government officials, students and international delegations. Last year the released number was "over 30,000" and in 2011 it was 27,714. The PDAC released new branding at the show. PDAC president Glen Nolan posted a picture of his new business card. The 2014 show will be held from March 2 to 5. 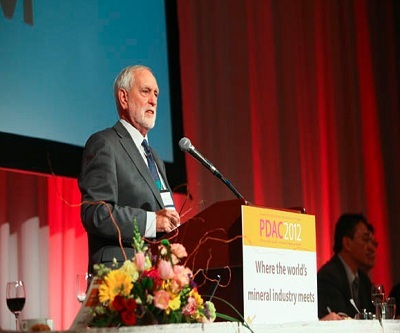 Photo courtesy of PDAC 2013.